Eruption of Fuego volcano, June 3, 2018. A volcano southwest of Guatemala City has erupted for the second time in five months, sending a deadly plume of super-heated rock and gas into the rural communities below. At least 25 people have been killed, but the death toll is expected to rise. When the Fuego volcano erupted in February, it produced a one-mile-high (1.7 km) plume of ash, but yesterday’s eruption was of a different sort. On Sunday afternoon, the 12,346-foot-tall (3,763 m) mountain erupted, hurtling a column of ash a full 3.7 miles (6 km) into the sky. The explosion also triggered a deadly pyroclastic flow—a hot, fast-moving plume of rock and gas—that engulfed farms, streets, cars, and entire homes at the bottom of the southern slope. A long exposure shot of the eruption. Preliminary reports have placed the death toll at 25, but it’s likely higher given how many people remain unaccounted for. AFP reports that several children are among the dead. Hundreds of people were injured, and over 1.7 million have been affected. 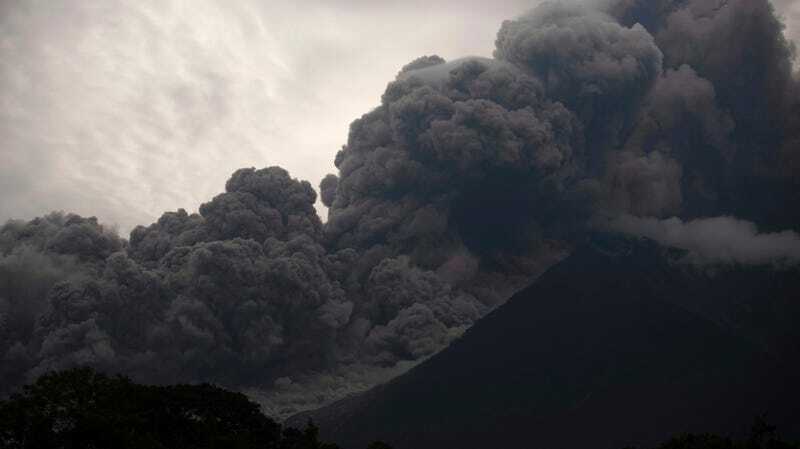 Guatemala’s international airport had to be closed, as workers scrambled to clean ash off the runways. So far, around 3,100 people have been evacuated to temporary shelters. Experts are concerned that Fuego—one of Central America’s most active peaks—may erupt again, producing another pyroclastic flow. Thick clouds of ash billowing out from the mountain. Sergio Cabañas, head of Guatemala’s National Disaster Management Agency, said the entire town of El Rodeo had been “buried.” Other affected communities include Las Lajas and the popular tourist town Antigua Guatemala. Yesterday, President Jimmy Morales issued a red alert for the Escuintla, Chimaltenango, and Sacatepequez regions, and an orange alert issued for the rest of the country. A state of emergency order is currently being considered by the Guatemalan government, according to the BBC. Drivers make their way through a light rain of volcanic ash, as Fuego erupts near Guatemala City. The Fuego volcano is located about 25 miles (40 km) south of Guatemala City. In 2012, the volcano triggered an evacuation of 10,000 residents, and in 2015 it forced an airport closure. 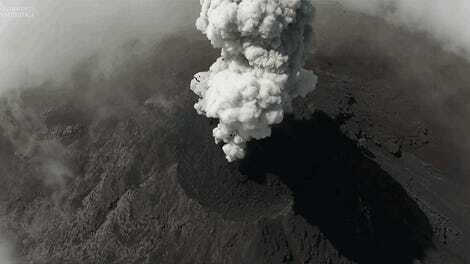 This is the deadliest eruption in Guatemala since 1902, when the Santa Maria volcano killed thousands of people.